The postcode for your Sat Nav is GU21 7SE, and this will bring you to the shop front. We are on a mini-roundabout opposite The Ketch fish and chip shop. 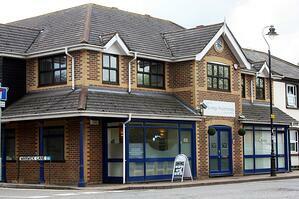 We also have 4 dedicated spaces behind our clinic. As you look at the shop front, parking is accessed by the left hand side, down Warwick Lane. However, please do not park in Warwick Lane as this often blocks access for the residents. The nearest railway stations are Brookwood (2miles) and Woking (3miles). We would recommend getting a taxi if coming from either station.